Pakenham, originally the product of a small settlement built around the railway station en route to Gippsland, has become a commuter suburb of Melbourne, 57 km east of the city centre. Soldier settlement after both world wars relied on growing fruit and vegetables, and processing plants were built. Suburban electric train services reached Pakenham in 1975, and its liveability has improved with the Princes Highway bypassing the city centre in 2007. The area was originally part of the territory of the Bunurong tribe, but little record remains of their occupation. About 1843 a pastoral run was taken up on the Toomuc Creek and in 1850 a hotel was established where the track into Gippsland crossed the creek. The hotel soon became a coach staging post and the nucleus of a small settlement serving the surrounding grazing district. The township was known as Pakenham since survey in the 1850s, thought to honour General Pakenham who served in the Crimean War. Since the 1850s, as the large runs were broken up, many settlers moved into the area. Grazing and dairying were the main agricultural pursuits and a large orchard was established in the Toomuc Valley, north of Pakenham, from the 1870s. Settlers moved into the hills north of Pakenham in the 1870s, establishing a small settlement first known as Gembrook South and later Pakenham Upper. Sawmills worked in the area and later many large orchards were planted. The community had a school (1879), hall and store. In 1877 the first section of the railway into Gippsland was constructed south of the coach road. A canvas town housed about 400 people while stone for the line was quarried from a nearby hill. The railway station was built about 3 km south-east of Pakenham on Toomuc Creek. In 1880 a hotel was built near the station and other businesses soon followed. 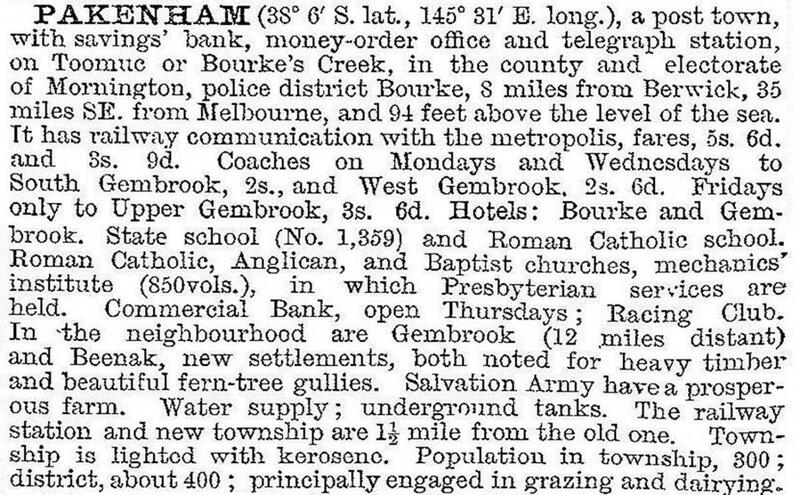 The Victorian municipal directory described Pakenham as a town on Toomuc Creek, with a school, two churches and two hotels. The population, about 80, was engaged in grazing and dairying. New Pakenham had the court house, mechanics' institute and two banks. There was intense rivalry between the two townships, but the old town gradually declined while Pakenham East, as it became known, flourished. Several denominations constructed churches and the school (1891) moved closer to the station. In 1902, the headquarters of Berwick Shire moved to Pakenham East and a shire hall opened in 1912. A newspaper shifted from Berwick in 1917, commencing publication of the Pakenham gazette. A racing club held meetings and an agricultural and horticultural society held its first show in 1911. During the 1890s economic depression the Salvation Army set up a farm colony just north of Pakenham. Land was cleared and many acres of orchard were planted. A sawmill provided timber for building and later produced fruit cases. The colony dwindled as the depression eased and the buildings were used to accommodate boys, then girls, and finally aged men, before closing about 1920. Army Settlement Road marks the event. In the 1920s there was some subdivision for solider settlement, mainly dairying, and regular cattle sales were held. In the foothills to the north of the town, many apple orchards were established. The large Toomuc Valley Orchard had its own cool store and fruit evaporating plant. The Pakenham East township continued to grow, with a bush nursing hospital constructed in 1926 and a picture theatre in 1927. By 1938, the Victorian municipal directory described a substantial town with two post and money order offices and telegraph and telephone offices, police station, court house, shire hall, five churches, bank, two hotels, recreation reserve, show ground and race course. The cool store could hold 15,000 fruit cases, and the town had electric light and water. After World War II, more soldier settlement in the district encouraged further development. A consolidated school incorporating post primary classes, opened at Pakenham East in 1951 and by 1970, over 600 students attended the school. A Catholic school, established in the 1870s, also continued to grow. In 1952, Raleigh established a plant processing green peas and fruit. Taken over by Nestle in 1960, this operation greatly expanded over the years and was taken over by Simplot in 2000. A stockfeed factory commenced operations in the 1960s and a cider barrel factory worked in the 1970s. There is a pottery, as well as a large number of light engineering, building and service industries supporting the surrounding agricultural district. In 1999 a large livestock selling facility opened in Pakenham, replacing the Dandenong saleyards. From the late 1960s Pakenham was part of a growth corridor of planned urban expansion. The Housing Commission acquired about 400 hectares of land and part of this was developed as a housing estate. A secondary school was built in 1970 on part of the property and in 1997 Pakenham Consolidated School also moved to a new site there. Suburban train services were extended to Pakenham in 1975. In 1973 Pakenham Shire was separated from Berwick Shire and in 1983 large new administrative offices were opened on the edge of the town. By the 1990s, further housing development occurred north of the town and a new primary school, Pakenham Hills, was opened in 1995. The increased population stimulated expansion and redevelopment of the shopping centre, including the advent of a large supermarket. In 1999 the old picture theatre was demolished to allow construction of another major chain store. In addition to the State secondary college there are the Anglican/Uniting churches, Beaconshill P-12 college (1982) next to St James Anglican church (1885) and the Lakeside Lutheran college (2006). Additional State primary schools include Pakenham Springs (2008), Pakenham Hills and Pakenham Lakeside, and schools named Pakenham South West and Pakenham North West. The last mentioned show how urban Pakenham has grown toward Officer. In 2007 the Princes Highway’s route through Pakenham was relieved by the Princes Freeway, looping southwards from Beaconsfield, around Pakenham, and rejoining the highway at Nar Nar Goon, Within a few years further development emerged adjacent to the south side of the freeway with the South East Business Park (164 hectares). Further urbanisation may be inhibited by the nearby livestock exchange, the waste treatment plant and an abattoir (extended in 2013), but ambitious developers may find a way around these facilities. Pakenham West has a linear park along the Toomuc Creek and a number of other reserves and wetlands. Urbanisation shades into the housing at Officer, upon crossing the boundary along Cardinia Road. A railway station on Cardinia Road opened in 2012. After council amalgamations in 1994, Pakenham became the administrative centre of Cardinia Shire. The town still serves the surrounding farming district but is undeniably residential. Metropolitan railways transport commuters to Dandenong and Melbourne for employment. Ambulances transport hospital cases to Dandenong since closure of Pakenham’s in 1998. Rural Pakenham South includes a margin of the former Koo Wee Rup Swamp and has a hall on McDonalds Drain Road West. Pakenham had four local newspapers, each published weekly.